NEW YORK -- The Batmobile used in the 1960s "Batman" TV series is expected to go up for auction in January, the Barrett Jackson auto auction house said Thursday. Some particularly iconic TV and movie cars have gone for very high prices. For example, a highly modified 1964 Aston Martin DB5 used in James Bond films sold $4.6 million in 2010. The Batmobile started life as the Ford (F) 1955 Lincoln Futura concept car which, itself, was based on a Lincoln Mark II. Besides its pearl white paint job, the Futura actually looked very much like the Batmobile it would become over a decade later. 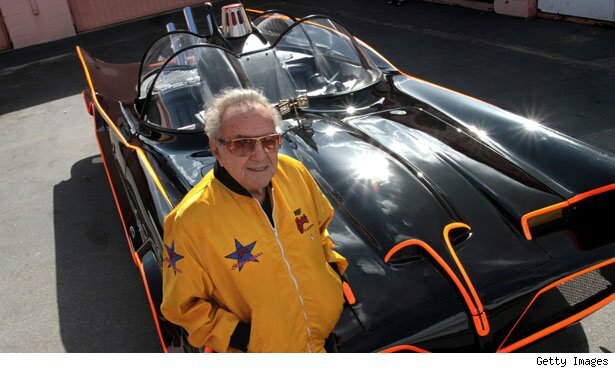 Famed car customizer George Barris -- also known for creating the Munster Koach for "The Munsters" and Clampett's car for "The Beverly Hillbillies" -- was tasked with creating the Batmobile in 1966. With a tight deadline, he decided that modifying the Futura, rather than starting from scratch, was the way to go. On television the Batmobile's technology allowed it to shoot flames, squirt oil and shoot tire slashers, but the car is not actually designed to do any of that. Unlike the Bond Aston Martin's multi-million dollar price tag, Jonathan Klinger, with the collector car insurance firm Hagerty Insurance, thinks the Batmobile will probably sell for a few hundred thousand dollars. The trouble, he said, is that there are so many very good Batmobile replicas around. "It's just a matter of where you put the commas and the decimals," he said. "They all slide over for the real thing.